This classic text provides a comprehensive, accessible overview of substance misuse and dependence with an emphasis on practical and evidence-based approaches to the assessment, management and prevention of a wide range of drug-related problems, in a variety of clinical and social settings. 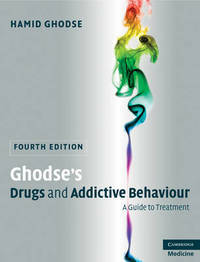 The book includes definitions of terms, and describes the effects and clinical characteristics of all substances of misuse. The theoretical background to these topics is clearly explained. For the fourth edition, every chapter has been revised to include the most up-to-date information, with the latest international data on the extent of the world drug problem. There is detailed emphasis on harm minimization, AIDS and hepatitis C and entirely new coverage of tobacco addiction and its management. This is an essential guide for all healthcare workers, health policy specialists, counselors and those seeking to train in areas related to addiction and substance misuse. Hamid Ghodse CBE is President of the United Nations International Narcotics Control Board and Professor and Director of Psychiatry at the International Centre for Drug Policy, St George's, University of London, UK.